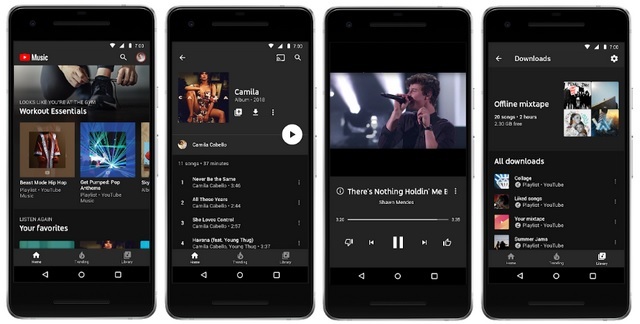 As announced earlier last week, Google is putting the plan to simplify its music streaming catalog into action and has today initiated the roll-out of its revamped YouTube Music subscription to early access users – those who signed up to try it out before everyone else. First, the subscription costs – the new YouTube Music service will be available to all users for free but you’d have to bear with the ads. If you want to skip ads, you can pick a $9.99 per month YouTube Music Premium subscription without ads, or $11.99 per month for YouTube Premium (formerly YouTube Red) to also gain access to original video content as well. As for the new set of features, the first thing anybody would notice is that the YouTube Music app and desktop player has been redesigned with a card-style layout – that is reminiscent of Spotify. The highlight feature of the new app seems to be ‘Smart Search’ feature that can help you find a song even if you don’t know what it was called. You can simply type in ‘Avengers movie soundtrack’ in the search bar and YouTube Music will suggest you related results right away. The homescreen now adapts to your music tastes and offers you access to thousands of playlists and recommendations based on ‘what you’ve played before, where you are and what you’re doing,’ says the blog post. And since YouTube is a video streaming platform, Google boasts that you not only get access to soundtracks but remix, covers, and live performances as well. The paid subscribers, on the other hand, have added benefits. They can enjoy an ad-free experience, download music (along with your Offline Mixtape), and even listen to them in the background. Plus, if you’re a Google Play Music subscriber, YouTube Music Head T Jay Fowler confirms that Google Play Music “collection, playlists, and preferences” will directly be migrated to the new YouTube Music. Early access to the new ‘YouTube Music’ app is now available to subscribed users in the U.S, Mexico, Australia, New Zealand and South Korea. The company plans to roll out its streaming service, in direct competition to Spotify, in all other regions where it provides Premium services in the next few weeks.